A longtime history and way of life in West Virginia is quickly beginning to fade away and there is nothing anyone can do about it. The cold-hearted fact is, coal mining in this state and the rest of the Appalachia region will come to an end within the next ten years. Don’t blame it on Obama, the EPA or any other entity, it’s just the natural progression of life after we welcomed natural gas as a source for electricity. Anyone who can honestly say they did not see this coming has been living under a rock. This is the same scenario that allowed foreign countries and their industries to come to America and buy us out. We welcomed them with open arms because we were in need. When it was over, we blamed everyone but ourselves for letting it happen. Natural Gas is the future and everyone from the gas companies to the lawmakers who paved the way through legislation right up to the landowner who leased out his mineral rights to drill natural gas is enjoying the windfall. And there is plenty of it to go around. I can also assure you our politicians are right behind it all hoping for it to succeed. If there has been one key factor that has foretold the coal industries demise it was the recent media stories proclaiming how… 'For the first time in U.S. history, natural gas generated as much electricity as coal.' And within the next 7 to 10 year’s natural gas exploration and production will leave the coal industry in its own dust. Up until recently, coal supplied 50% of the nations electricity. In 2012, reports show coal and natural gas are equal in their use to produce power. Experts predict that the need for coal will drop to 40% by the end of this year and 30% by the end of the decade. Coal generation decreased 29 billion-kilowatt hours from March 2011 to March 2012, while natural gas generation increased 27 billion-kilowatt hours during the same time period. Natural gas prices were near 10-year lows this winter, causing some states such as Ohio and Pennsylvania to increase their dispatch of natural gas-fired plants. Newer vintage natural gas-fired units operate at higher efficiency than older, fossil-fired units, which increases the competitiveness of natural gas relative to coal. While natural gas production is on the increase and states are building more and more natural gas fired power plants, coal mines are laying off workers and shutting down coal mines as utilities increasingly switch from coal to natural gas. According to statistics, gas exploration and production is cheaper, safer and less destructive to the land, (such as strip mining-mountain top removal) it is also more environmentally friendly. According to the Government Accountability Office, power plants that burn coal produce more than 90 times as much sulfur dioxide, five times as much nitrogen oxide and twice as much carbon dioxide as those that run on natural gas do. Sulfur dioxide causes acid rain; nitrogen oxides cause smog; and carbon dioxide is a so-called greenhouse gas that traps heat in the atmosphere. Thousands of coal miners have been laid off just in the Appalachia region this year. Mines have shut down and thousands of more workers depending on the industry, have also lost their incomes. Just 2 months ago, one of the largest coal companies in the world (Arch Coal) laid off 750 workers in Kentucky and WV and closed 4 of its mines altogether. They announced cutbacks in production at 3 other mines. According to Arch President and CEO John W. Eaves. "Current market pressures and a challenging regulatory environment have pushed coal consumption in the United States to a 20-year low." These job losses come as utilities increasingly switch from coal to natural gas, which has become cheaper as supplies grow. The current ongoing push for natural gas production is in the Marcellus Shale areas in WV, PA, NY, OH and parts of VA. Production there is anticipated to soar over the next 3 to 5 years. In early 2008, Terry Englander, a geoscience professor at Pennsylvania State University, and Gary Lash, a geology professor at the State University of New York at Fredonia, surprised everyone with estimates that the Marcellus is estimated to contain more than 500 trillion cubic feet of natural gas. How much natural gas is anticipated just from the Marcellus Shale basin? Approximately 10% of that gas (50 trillion cubic feet) is projected to be recoverable. That volume of natural gas alone would be enough to supply the entire United States for about two years and have a wellhead value of about one trillion dollars! Early production rates from some of the new wells has been over one million cubic feet of natural gas per day. The technology is so new that long term production data is not available. The mere presence of an enormous volume of potentially recoverable gas in the eastern United States has a great economic significance. This will be some of the closest natural gas to the high population areas of New Jersey, New York and New England. This transportation advantage will give Marcellus gas a distinct advantage in the marketplace. As with most gas wells, production rates will decline over time, however, a second hydraulic fracturing treatment could re-stimulate production. And, after that, there is another untapped resource right below Marcellus that has not received a lot of publicity to date. 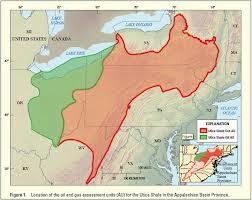 Whats Under The Marcellus Shale? Although the Marcellus Shale is the current drilling target, there is yet another rock unit with enormous potential and it is only a few thousand feet below the Marcellus. The ‘Utica Shale’ is thicker than the Marcellus, more geographically extensive and has already shown that it can be of commercial value. When the yield of Marcellus Shale wells start to decline, new wells might be drilled down to the Utica to continue a stream of natural gas production. Drilling for the Utica will be more expensive because of the greater depth, however, the infrastructure of drill pads, right-of-ways, pipelines, permit data and other investments will reduce development costs for Utica Shale wells. Natural gas exploration is nothing new to the United States. Neither is the methods used to produce these trillions of feet of gas. Besides the Marcellus and Barnett Shale of Texas. There is the Fayetteville Shale of north central Arkansas, the Haynesville Shale of northwestern Louisiana. These are just a few of several unconventional gas plays now happening in the United States and Canada. Exploration in other states are ongoing. Similar organic shale deposits in other parts of the world might also produce gas as use of the new technologies spread. There have been times before when coal's demise has been prematurely predicted, most notably in the 1980s. This time, people like renowned University of California’s fossil fuel expert, David Victor says it is different. “Coal is on the way out because of the EPA, new regulations and natural gas. We could see coal down at 15 or 20 percent of electric supply over the next decade, that would be a huge change in an industry that historically has relied on coal for 50 percent or more of the electric supply." Remembering back to the warnings in the 1980’s, People were talking about the death of the coal industry, but coal was half of the electric power supply. "Now," according to Victor, "we're talking about terminal illness for coal in the advanced industrialized countries, and it is actually happening." Even with Obama, the EPA and other lawmakers openly targeting the coal industry, it all comes down to the fact that natural gas is becoming the new industry to produce our electricity. Yes, there will still be a need for coal, most likely in other countries, but that to will play out as those countries search out different and more efficient sources than coal. Robert Ukeiley, an environmental lawyer in Berea, Ky., said it's ridiculous to blame environmental regulations for the coal industry's struggles. He said those rules are completely reasonable, have been decades in the making and are a moral no-brainer. He said it is just a simple fact that "cheap coal in central Appalachia has been mined out. There is no politician who can change that or scapegoat anybody." Remaining coal supplies tend to be more expensive to extract and aren't as profitable, he said. "Central Appalachia would be experiencing almost as much decline in coal mining even if we had the most anti-environmental president of our history in place," Ukeiley said. As hard as it is to accept, coal mining as a leading industry in this region is coming to an end. We might as well face it now and work on a solution to possibly provide miners the opportunity to cross-train in the natural gas industry for the near future. This author has many relatives (past and present) that either work directly or indirectly in the coal industry. I can’t honestly imagine what these men and women are enduring that depend on coal for their way of life. A way of life that has been handed down from generation to generation. West Virginia’s leading coal producing county (Boone County) has seen its unemployment rate go from 4% to 12% and that directly reflects the lay offs and closures in the coal industry. Don’t think for a second that our top leaders in the statehouse and in Washington don’t know whats coming for the coal industry. They know it and are doing their best not to have to own up to that fact, at least not until after the upcoming November election. States are broke. Municipalities are broke. We're reducing the number of teachers and reducing the investment in education. Does anyone really think this is a recipe for success? If we want to be competitive in the global economy, we need to make some serious changes. Now. Our country has fallen behind in key areas of education. America needs to be the leader in education, in innovation, in manufacturing and in technology. There are over 7 billion people in the world and only 314 million Americans. To lead, we need everyone to be educated and equipped with the skills of the future. Shockingly, our education system has not changed in two hundred years. We still require every student to learn the same way, at the same time, in the same classrooms, with the same lectures, using outdated and one-dimensional learning materials. We are more focused on historical subjects versus preparing our best and brightest for the skills they need to excel in a future of innovation and flux. Everyone agrees it's broken, so why are we waiting? If we wait for government, entrenched institutions or the companies that have made a fortune protecting the past, we will lose another generation of students. We can make education more accessible, more affordable and more relevant using technology. If we embrace what is and what needs to be done, rather than what was, we can move forward. There are approximately 3.6 million open jobs in America, but there's a skill gap forming between what's being taught and what employers require to fill a position. My company, Chegg, the student hub, studied 3 regions in April of this year and compared open jobs in the area this year with recent graduate majors. The results were revealing and troubling. Fifty-four percent of jobs in San Jose, California fall within the area of IT, but only 2 percent of students in the area are graduating with IT degrees. Thirty-nine percent of the jobs in Columbus, Ohio also fall within the area of IT, but only 2 percent of students are graduating with IT degrees. And, in Miami, Florida, 36 percent of the open jobs are in the accounting/finance field and just 4 percent of students in the area are graduating with accounting/finance degrees. In addition to graduating without the skills for the future, students and their families are accumulating a staggering amount of debt, which has grown to over one trillion dollars in the U.S. Today, students spend dozens of hours a week just on their academics. And many of those students have multiple jobs to offset rising costs. The concept of attending a class at a specific time or meeting with a professor at random and inconvenient office hours can no longer be the norm. This generation is growing up with an entirely different view of how, who with, where and even, what time of day they should learn and interact. Students today have never known a day without technology, the Internet, mobile phones, Skype, Google or Facebook. As a result, they don't understand or value the historical bias that everyone needs to learn the same information, on the same day, the exact same way. We need to shift our focus to the students versus the administration and those who've sold billions of dollars worth of product to institutions. It's time to re-conceptualize education. We need to allow students to learn how they want, when they want and where they want -- whether it's in the classroom, via text, through video, in study groups with their class, in study groups at their school or even online with students around the world. Technology allows us to focus directly on the needs of today's students, eliminating the historical boundaries of time, location, tools, scale and even cost. Many schools are working to embrace the change; testing emerging new tools to help students master challenging subject matter. Students are helping drive the change using new types of learning tools and materials from new sources -- some of which don't even come from their own institutions. Perhaps, for the first time in our history, students are more experienced and skilled at the most powerful learning tool of our lifetime (technology and the Internet) then those who are charged with teaching them. This is causing an uncomfortable situation between students and educators and should cause us to accelerate teacher training to help educators adapt, learn, and test new types of learning tools. The ultimate goal is for the student to master subjects and expand their minds, but it is as just as critical that they can access and learn the job skills of the future. The time is now to fix our failing education system. This is not a Democrat or Republican issue, this is an American and economic issue. For those of you who have a genuine interest in fixing our education system, especially higher education, please share your ideas about innovative technologies, schools and strategies so -- together -- we can collaborate and help our students and our country succeed. The U.S. Supreme Court heard arguments today in two cases testing what, if any, limits there are to the police using drug-sniffing dogs. By the close of two hours of argument, it looked very much as though the court would rule against the use of drug-sniffing dogs without a warrant in one case, but not the other. The protagonists in this story are Franky and Aldo. Franky, a chocolate Labrador, had a near-spotless record as a drug-detection dog in Miami-Dade County. The question is whether his human police partners violated the Fourth Amendment's ban on unreasonable searches. After police got an anonymous tip, they took Franky up to the front porch of a private home, and when he alerted to drugs inside, the police used that as justification for getting a search warrant. Aldo had a less august dog-detection pedigree, and the question was whether his qualifications as an expert were sufficient to justify the sniff of a truck. Lawyer Gregory Garre represented Florida police, prosecutors and the dogs in both cases, starting with the one that involved a dog sniff at the front door of a private home. Garre's argument, in defense of Franky's sniff at the home, was that Franky was trained only to look for drugs. In three prior cases, Garre reminded the justices "the court has emphasized that a drug-detection dog reveals only the presence of contraband, and that nobody has a legitimate expectation of privacy in that." But justices of every ideological stripe hammered Garre on that argument. Justice Anthony Kennedy said he could not accept as a reasonable argument the premise that if there's contraband, "all the rules go out the window." Justice Sonia Sotomayor added that if you have no expectation of privacy for contraband, "why bother with a search warrant" at all. Justice Ruth Bader Ginsburg chimed in that if a dog sniff of one home is OK, the police could just go down the street with a dog, going door to door. Garre responded that the police could indeed do that, just as they can knock on every door. But limited resources, he maintained, would prevent such dragnet searches. For Justice Antonin Scalia, the place of the dog sniff mattered, because a home is private. "It isn't sniffing in the abstract," he said, "it's sniffing at the front door." Garre emphasized that there exists an implied consent for police, Girl Scouts or trick-or-treaters to go up to the front door. But Ginsburg interjected, saying there is no implied consent for a policeman to come up with a dog when "the only purpose of the dog is to detect contraband." Justice Stephen Breyer also took issue with Garre's argument, saying that people do have the expectation that someone can come to the door, but not with "a large animal" who spends five to 15 minutes going back and forth sniffing the premises. Finally, Justice Elena Kagan observed that the court has repeatedly protected the home from technological surveillance without a warrant. To that, Garre responded, "Franky's nose is not technology." Kagan pressed the question, wondering if a machine were invented to detect drug odors from outside a house, would that be permissible without a warrant, too. No, replied Garre. Dogs sniffs are different than machines because they involve the dog's "God-given sense of smell." Garre's adversary, public defender Howard Blumberg, representing the accused marijuana grower, also got quite a grilling from the court. Kennedy called Blumberg's argument that people have a right to keep secret anything they want within their home "equally unacceptable" to Garre's argument. Blumberg was more successful with his second argument — that the dog sniff at the front door of a home is a trespass on private property. He cited cases as far back as the 1700s that stand for the proposition that a man's home is his castle. The Supreme Court has never ruled on dog sniffs at a private home. It has said dog sniffs are permissible without a warrant in other spheres — cars stopped on the road for other reasons, for instance, or luggage at airports. But, as Wednesday's second argument illustrated, even when a search could be legal, there is a question as to whether the dog has adequate credentials for police to rely on. In this case, Aldo, a German shepherd, sniffed and alerted for drugs in a truck stopped for an expired license plate. Police then searched the truck and found chemicals used to make methamphetamines. Two week later, however, when police again stopped the truck, the dog again alerted for drugs, but this time, no drugs were found. Aldo had completed 120 hours of basic drug-detection training two years earlier, but the dog had not been recertified in 16 months — a defect that lawyer Garre acknowledged was "a lapse." Public defender Glen Gifford told the justices that since there is no national or state certification standard for drug-detection dogs, judges should look, among other things, to field records of the dog's other searches to determine his reliability. The justices, however, seemed to think that was a step too far. Two weeks ago, WV News sent information to the News & Sentinel Newspaper regarding evidence we obtained showing Wood County Commissioner Blair Couch had additional public records showing the state had filed another lien against him in reference to his failure to pay state property taxes. Also, court records showing the Department of Child Services instigated paternity and child support proceedings showing Blair D. Couch refused to pay child support until the Court ordered him to do so back in 1998. Which included back support in the amount of $27,841.31. Couch, who is running for reelection as Wood County Commissioner has a long history of avoiding his debts and other obligations as detailed in prior stories linked below. A source at the News & Sentinel responded to our request asking that the paper look into Couch's neglect towards his personal financial responsibilities since part of his duties as President of the Commission is to oversee the Counties money and finances as well. If he won't manage his own financial responsibilities, how can he maintain those of the counties $20 million dollar annual budget? According to the unnamed source at the Parkersburg newspaper, the editorial staff already possessed the information we sent, and other debts that Couch owes including back county taxes. The response to our providing them the documents was simply “the newsroom staff has this already but can't publish anything negative about Commissioner Couch.” The email came from a personal account, not the newspapers business e-mail system but we verified they are employed at the News & Sentinel. We found one story the paper had published regarding back taxes he owed on his former business, but it was written in a positive approach most favorable to Couch. The two latest documents obtained show that on August 22, 2011 the state filed a notice of tax lien #1403458 against David B Couch (and wife) for failure to pay his 2009 state taxes in the amount of $324.00. Couch eventually paid a total of $473.99 and the lien was released. Other tax records with the county show personal taxes being paid late and a current outstanding bill over $17,000 that he still owes from his former business A.W. Couch Inc that he simply changed the name to DC Fleet Sales and kept operating at the same location. The paternity-child support case was filed in the Wood County Circuit Court in 1997. Case #97-D-207 (PAT) and was brought on by the Department of Health and Human Resources, Bureau of Child Support Enforcement. The plaintiff, “KM” was to establish paternity and child support. He was ordered to pay $605.67 a month and also ordered to pay back support of $27,841.31 along with $3,086.00 for hospital bills and $171.00 for genetic testing. The case was heard on May 20th, 1998 and the final order was signed on October 15th, 1998. What began back in late 2010 as a regional SSA scandal alleging fraud and 'case-fixing' of disability appeal claims with the Office of Disability Adjudication Review (ODAR) office in Huntington WV, now has federal authorities and US Senators focusing their attention on the national ODAR offices too. According to an inside confidential source involved with the Office of Inspector General's Office, (OIG) as the total magnitude of both the local WV scandal and overall problems within the entire ODAR completely unfolds, government officials will ultimately hold SSA Commissioner Michael J. Astrue accountable for what occurred. "It's my understanding that between this scandal and other problems within his office, Astrue will be replaced at the end of his term." President Bush appointed Astrue in 2007; his six-year term ends January 19, 2013. Since assuming his role as Commissioner, Astrue has been plagued with problems that seem to be ever mounting. There is the unsolvable three-quarter of a million plus backlog of pending disability appeal claims that sit idle years before a final decision is rendered. A high number of SSA employees are leaving the agency, and the ongoing debate on how SSA officials will fund Social Security benefits for current recipients and future generations. Now, there is the recent US Senate Subcommittees report addressing problems of policy abuse and procedures by additional Administrative Law Judges in other ODAR offices across the country. The subcommittee began their fact-finding inquiries after this website and national media exposed how former Huntington WV Judge David Daugherty had circumvented SSA disability procedures when he and lawyer Eric C Conn were allegedly mass approving SSA disability appeal cases with little to no court hearings, conflicting medical evidence or proper judicial consideration. Daugherty is also accused of re-directing other Eric Conn cases to himself that were already assigned to other judges. During the time period between 2005 to 2011, Daugherty's overall approval rate averaged 96 to 98% compared to national average of 40%. Daugherty was approving 100% of cases where Eric Conn represented the claimant. 1) Require government representatives at all ALJ hearings to ensure key evidence and issues are properly presented. 2) Reduce instances in which SSA ALJ's overlook evidence. 3) A need to strengthen the quality review processes. 4) Close the evidentiary record. 5) Strengthen use of medical listings and expedite updated job list 6) focused training for ALJ's. 7) Strengthen consultative examinations. 8) Reform the medical-vocational guidelines. The primary focus of this federal investigation surrounds former ALJ David Daugherty and Eric Conn, who are being accused of operating an elaborate appeals claims scam that lined Conn's firm with millions of dollars in SSA awards and the former judge with approval ratings as high as 98%. Daugherty made media headlines that exposed his higher than normal approval ratings & connection to attorney Conn back in January 2011. Then, in May of 2011 the Wall Street Journal published numerous articles about Daugherty and the reported connections with Eric C. Conn. The Office of Inspector General and US Attorney began investigating Daugherty and the Huntington ODAR office. Soon after the accusations against Daugherty were in the media, he was placed on indefinite leave of absence while at the same time claiming he had done nothing wrong. By the summer of 2011, David Daugherty retired as an Administrative Law Judge. Several months later, chief ALJ Charles Andrus stepped down as lead judge. Within 2 months of the OIG beginning their investigation, hearing Office Manager David Hall abruptly resigned along with the termination of the Huntington offices IT tech employee. Earlier this month, ALJ Charles Andrus told several office employees in Huntington that he would be resigning by the end of this year. He has been hinting about a retirement since August 2011. Andrus is accused of knowing about the connections between Daugherty and Conn but did nothing about it. He stepped down as the Chief ALJ back when the scandal first broke. Andrus has also been the focus of several federal lawsuits filed against him for alleged racial discrimination and retaliation against a whistle-blower by another former ALJ Al Tinsley who quit and went to work for Eric C. Conn's Law Firm. Tinsley has also claimed Andrus personally brokered the negotiations with Eric Conn to hire Tinsley so that he would retire and drop the lawsuits. How much money could Eric Conn be making during this time period if Daugherty was approving 100% of his cases? He has claimed in his TV commercials and billboard advertisements that his firm handles 65% of all SSA appeals in the Huntington region office. From January 2010, to September 2010, Judges awarded 3,696 appeal claims. If Eric Conn's office actually handles 65% of all cases, that would be 2,402 awarded clients. Just using the $3,500 average that lawyers make per case, equals out to $8,407,000.00. According to this same government source, OIG investigators have once again returned to Huntington WV's Social Security Appeals Office. This time, their interest is in 2 new allegations that are directly related to the ongoing federal probe of Daugherty and Conn. New evidence has reportedly surfaced that another Administrative Law Judge, William Gitlow, has been allowing attorney Conn and his staff to write their clients actual appeal decisions and forward them to Gitlow. A practice that is both unheard of and forbidden by the Office of Disability Adjudication and Reviews 169 offices across the US. E-mail evidence was reportedly discovered detailing correspondence that shows attorney Conn being permitted to write the lengthy decisions in order to both expedite the approval of his client's cases and to help boost Gitlow's percentages on disposition of pending appeals. Reportedly, this practice began after Eric C. Conn was already under OIG investigation beginning back in August of 2011 for his involvement in the case-fixing scandal with Daugherty. OIG field agents are also looking into possible witness intimidation and harassment that leads back to at least one current management staff at the Huntington Office. The allegations surround one cooperating SSA employee with the ongoing investigation who was being followed on numerous occasions after work hours in an attempt to obtain information to hopefully discredit their credibility. OIG agents are said to have identified a person of interest who was seen following the witness on several occasions and once seen taking pictures of them while at a social gathering. As for the overall Huntington investigation, "The US Attorney's office has been presenting evidence and witnesses to a grand jury to determine if any criminal charges are warranted" claims this same source. And, there are reports that indictments may be forthcoming as the investigation wraps up. Several of the cooperating witnesses that appeared in front of the federal grand jury are reported to be former employees of the Eric C. Conn law firm. Eric C. Conn has faced other indiscretions dating back to 2002 when he elected to resign from practicing law in the US Court of Appeals for Veterans (USCAVC) after being investigated by the feds for alleged professional misconduct in reference to his clients cases filed in that court. Conn elected to forgo his practicing in the USCAVC in order to halt that investigation. The court stipulated that, "the resignation of Eric C. Conn from the Bar of this Court, conditioned by his relinquishment of any right to apply for reinstatement or readmission, is accepted, and his name is hereby removed from the rolls of practitioners admitted to practice before this Court." September 30, 2002 PER CURIAM." In this courts 2002 order, they stated, "Although the Court is concerned by the alleged professional misconduct of the respondent, his agreement to cease all practice before this Court provides the Court and its appellants with protection from any repetition of such conduct by him. Moreover, no appellant has filed a complaint with the Court relating to professional services provided by the respondent. Therefore, the Court will accept the respondent's resignation." Some people say that the ongoing scandal in Huntington WV is just a single incident of corruption that does not reflect the overall ODAR system. Others believe that this situation occurred because of the intense pressure put on ALJ's and office management to drastically decrease their backlog of pending appeals. Which then caused corruption in at least one office and sloppiness throughout the ODAR offices. Some of this conjecture may be true. Since at least 2005, the SSA's Office of Disability Adjudication and Review has come under fire for the huge backlog of disability cases that have sat for up to three years waiting for final determination if a claimant will receive benefits. Back in May 2007, SSA Commissioner Michael Astrue assured Congress that SSA would correct the problem of surging growth in the number of individuals awaiting a hearing for disability benefits. He described an ambitious plan the agency had recently launched "to eliminate the backlog of hearing requests by 2012" and also "to prevent its recurrence." At that time, appeals of 715,568 individuals were pending before what is arguably the largest court system in the world. Four years later, in March of 2011, the commissioner testified again, emphasizing his accomplishments since 2007 that included the appeals hearings backlog problem. He also testified that SSA significantly improved service and stewardship efforts. Not exactly true according to at least one respected watchdog group. But, information analyzed by the Transactional Records Access Clearinghouse, (TRAC) indicated that the overall number of individual claimants awaiting a hearing has not gone down but climbed to 746,712. That's 31,144 cases higher than it was when the SSA launched its expensive rehabilitation plan in 2007. Commissioner Astrue faces other SSA problems including the future of even being able to fund Social Security benefits. According to the 2011 Trustees' Report, without Congressional action, the Disability Insurance Trust Fund will be unable to pay full benefits beginning in 2018, just a little over six years from now. "The path we are on is unsustainable, and we are putting individuals with disabilities at risk if we do not act soon." He sums up the total SSA picture, "There is no silver bullet, but we can't ignore fiscal reality and assume that we can go on doing business as usual. As Deputy Commissioner Colvin has said, we will do less with less. We continue to look for ways to streamline and simplify work and identify what work we can stop doing." While appearing on the "Today Show" with host Matt Lauer in 2009, Obama stated that "I will be held accountable" for his term as president. Also during that same interview, Obama claimed that within the first 3 years of his presidency, he would cut the deficit in half and rebound the economy. He was so trying to be confident in this interview that he goes on to tell Matt Lauer, "If I don't have this done in 3 years, then theres going to be a one term proposition." By his own admissions, Obama clearly understands that he should be held accountable, he clearly understood what he meant when he told Matt Lauer that if he (Obama) failed to cut the deficit in half and get the economy on the rebound, he would be a one-term president. The election is 20 days from now, lets hold Obama accountable and let's help him keep his word. As the election nears and the candidates enlighten us with speeches and debates, like last night's 2nd meeting between the candidates, keep one thing in mind. Barack Obama hasn't said anything new in 4 long years that he didnt promise already. His platform is the same scenario that he so eloquently portrayed on January 26th, 2008 while giving his "Yes We Can" speech in South Carolina. You remember that speech, the one that filled Americans with hope, comradery and changes, which the majority never came. Here are a just few excerpts from that speech. After you read them, tell me if Obama has fulfilled enough of his promises to give the American people a reason to believe again? Better yet, to believe in him again. Obama: We're up against the idea that it's acceptable to say anything and do anything to win an election. But we know that this is exactly what's wrong with our politics. This is why people don't believe what their leaders say anymore. This is why they tune out. And this election is our chance to give the American people a reason to believe again. Obama: But as hard as it may seem, we cannot lose hope, because there are people all across this great nation who are counting on us, who can't afford another four years without health care, that can't afford another four years without good schools, that can't afford another four years without decent wages because our leaders couldn't come together and get it done. Obama: Theirs are the stories and voices we carry on from South Carolina. The mother who can't get Medicaid to cover all the needs of her sick child. She needs us to pass a health care plan that cuts costs and makes health care available and affordable for every single American. That's what she's looking for. Obama: The teacher who works another shift at Dunkin' Donuts after school just to make ends meet, she needs us to reform our education system so that she gets better pay and more support and her students get the resources that they need to achieve their dreams. Obama: The Maytag worker who's now competing with his own teenager for a $7 an hour job at the local Wal-Mart, because the factory he gave his life to shut its doors, he needs us to stop giving tax breaks to companies that ship our jobs overseas and start putting them in the pockets of working Americans who deserve it and put them in the pockets of struggling homeowners who are having a tough time and looking after seniors who should retire with dignity and respect. "Yes, we can. Yes, we can change. Yes, we can." Obama: Yes, we can heal this nation. Yes, we can seize our future. And as we leave this great state with a new wind at our backs and we take this journey across this great country, a country we love, with the message we carry from the plains of Iowa to the hills of New Hampshire, from the Nevada desert to the South Carolina coast, the same message we had when we were up and when we were down, that out of many, we are one; that while we breathe, we will hope. He is still giving us the same speech format that began in 2007 and continues now. Which is Obama's biggest problem, open-ended empty, hollow promises. Everybody knows his policies have failed to turn the economy around. His actions have raised, not decreased the national debt. It's now at over $16 trillion compared to $10.6 when he took office. The Washington Post found that since Obama's presidency began, spending has been going up approximately 5.2 percent a year while The Associated Press put the figure at 3 percent. Either way, it is neither the "lowest pace in nearly 60 years," as Obama claimed. Unemployment is worse than when he took office. According to the Bureau of Labor Statistics, the country has 552,000 fewer jobs now than when the president was inaugurated. Obama also claims that government jobs decreased. Not only during his administration, but also during a recession. That could be true if you count government jobs on state levels that Obama is not directly in control over. The overall state and federal government workforce decreased from 22,576,000 in January 2009 to 22,570,000 in June of 2012. But, if you only take the jobs that Obama is directly responsible for, the totals increased since he has been in office. Statistics show that in 2009 when he entered office, federal government employment was at 2,061,700. In June 2012 it was at 2,204,100. An increase of 7%. According to PolitiFact.com, Barack Obama made an extraordinary array of campaign promises. To be exact, 508 pledges on everything from taxing the rich to ending the Iraq war. (Which he has done) He also vowed to safeguard the environment by capping carbon emissions. He pledged to push for comprehensive immigration reform and help homeowners after the housing market crashed. Above all, he would change the tenor of the debate in Washington." What PolitiFact considered to stand out as not only his his biggest broken promise, but also as an explanation for why so many of his other pledges either fizzled out or failed, was Obama's own failure to bring people together for a bipartisan agenda. First, no president will ever keep all of his or her promises made in order to get elected or while in office. Obama is no different, except he went on national TV and made assurances to Americans that he would cut the deficit in half, and rebound our economy. And he placed penalties for himself on those 2 top priorities for America's recovery. "If I don't have this done in 3 years, then theres going to be a one term proposition." Obama did keep his promise of providing Americans with a national healthcare plan, which will possibly go down in history as his legacy. If it holds up. Personally, I am forever grateful that Obama brought an end to the Iraq war and he is downsizing the number of US troops in Afghanistan. Hopefully that unbeatable conflict will end soon. But, that's not enough. In simple terms, he is the CEO of this corporation known as the United States of America. If any other CEO performed their job the same way, they would be replaced. Should we believe Obama the second time around? In his own words, "We're up against the idea that it's acceptable to say anything and do anything to win an election. But we know that this is exactly what's wrong with our politics. This is why people don't believe what their leaders say anymore." Isn't that exactly what he has done? Before and after his 2008 "Yes We Can" speech, Obama said anything he had to in order to get elected. Is he doing that again now? Are You Aware Of What Actually Drives The Price Of Gasoline? As you're pulling up to the gas pumps next time, pause to think about what it is that determines the price you're paying for that gasoline. It may surprise you who is profiting the most from your fill up. This is an easy answer: The number of people who are using fuel for transportation primarily sets change in the demand for gasoline. As the number of people driving grows, so will the demand and a predictable impact on the gas prices. The raw material for gasoline is crude oil. It is traditionally measured in barrels, and 1 barrel equals 42 gallons. The United States has abundant supplies of oil, from the deep-water regions of the Gulf of Mexico to the tight oil resources throughout North Dakota and Montana. Combined with Canada's oil resources which is one of the largest in the world, North America has enormous potential to add new reliable supplies to the market. And, the U.S. has one of the largest and most advanced refinery systems in the world. If you've ever read anything about the Middle East, then you certainly know that it is the center of the world's oil supply. That region sits on top of what is known as liquid gold. Expert's estimate the region holds more than 700 billion barrels of oil in its various fields and reserves, or roughly 56% of all the world's resources. Global markets set the actual price of crude oil, where buyers and sellers constantly react to supply and demand factors. Crude oil is by far the largest factor in the price of a gallon of gasoline. It accounts for 64 percent of the $3.85 average current retail price per gallon of regular gasoline according the US Energy Information Industry. To put that in perspective, about $2.46 of the average gallon of gas is due before the refinery touches the crude oil. Also, people have a misconception that companies can control the cost of gasoline by controlling the supply chain, and that is just not the case. According to reports, U.S. crude oil production in 2010 was 5.5 million barrels per day. But U.S. refineries processed 15.2 million barrels of oil per day, which is almost three times more oil than was produced in the U.S. That means our refineries have to purchase millions of barrels of crude oil at market prices from outside the US just to produce gasoline and other products for American consumers. Example, in 2010, ExxonMobil alone spent $198 billion purchasing oil around the world for its refining operations. The viscosity of oil ranges from light to heavy grades and by the amount of impurities it contains. The price for oil that is widely quoted is for light/sweet crude. This type of oil is in high demand because it contains fewer impurities and takes less time for refineries to process into gasoline. As oil gets thicker, or "heavier," it contains more impurities and requires more processing to refine into gasoline. According to Ken Cohen, vice president of public and government affairs for ExxonMobil Corporation, refining oil works in an easy way. First, crude oil is put into a boiler and turned into a vapor, from there, the vapor moves into a distillation chamber where it is turned back into a liquid. Different types of oil are formed depending upon the temperature they were distilled at. Gasoline, for example, is distilled at cooler temperatures than residual oils that are used to make products, such as asphalt and tar. Like any product, there are costs to manufacture it, so the manufacturer tries to recover those costs, plus make a profit when it goes to sell the finished product. The refining portion of a gallon of gasoline has, on average, accounted for about 11 percent of the price per gallon in 2011, according to EIA data. That means that a little less than 40 cents per gallon would be due to refiners' costs, wages, equipment, financing, plus their profits. Now in August 2012, its up to 18 percent of the price per gallon or roughly $.69 cents a gallon owed to refiners. Cohen states that during that same period in 2011, the U.S. market price for gasoline coming out of refineries was on average about 7 cents per gallon (-2 percent) below the refiners' cost of crude oil alone, and before accounting for their costs of upgrading the crude into gasoline. So, they were taking a loss before starting out and refineries faced a market where domestic gasoline prices were very weak relative to global crude prices. How does that happen? Refiners are "price takers" that operate on relatively low profit margins that are highly dependent on the market demand for petroleum products. That means at times, the value of a petroleum product coming out of the refinery isn't enough to cover the costs of obtaining and refining the crude oil. After the crude oil is refined into gasoline, the distribution process begins. First, the gasoline leaves the refinery largely by way of pipelines to local terminals. Distributors then load their trucks and transport the gasoline to a service station outlet. Each step in the distribution chain includes its own labor, capital equipment and other expenses that must be recovered by operators. These operators must also compete to sustain their profitability while also paying taxes and overhead costs. The current average cost added to a gallon of gasoline in the US for distribution & marketing is $.38 cents. Based on recovering these costs of getting gasoline to the service station and the costs of marketing it to consumers. 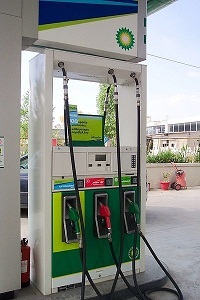 Retailors generally set their pump prices within their competitors prices. And on top of all that, they have to collect mandatory state and federal gasoline taxes from the consumer. The majority of stations are now independents or are owned by either local business owners or network retailers. Only a very small percent are owned by their logo brand corporate office. So how much does the government collect in tax revenue on a gallon of gas? You will be surprised; it is the second largest contributing cost to a gallon of gasoline. In January 2011, the American Petroleum Institute Tax Table combined state and federal taxes which shows a combined average of $.43 cents per gallon nationwide. California charges the most with $.66 cents per gallon, while Alaska is the least at $.26 cents. Global factors affect the crude oil market. Adding more supplies of crude oil to the marketplace can help put downward pressure on the price of a barrel of oil. But first, the oil needs to get to market. This is where economics are trumped by politics even as the U.S. economy remains weak. The recent moratorium in the Gulf of Mexico, as well as the decision to deny the permit for the Keystone XL pipeline from Canada to U.S. refineries, are just two examples of U.S. political decisions that serve to keep supplies out of the market. The "Big Oil" industry has also (unfortunately) made it into the current election arena by Obama himself, in the form of TV ad campaigns for reelection and as a topic in last week's presidential debate. While addressing the deficit on national TV, Obama claimed some oil companies are receiving "corporate welfare" because of tax breaks they are eligible for under section 199 of the tax code, which he feels some don't deserve. Obama also has at least one TV ad promising that he will "eliminate oil subsidies" if reelected. He has been criticizing the oil and gas industry for taking "billions a year in taxpayer subsidies." These legal tax breaks are one of the saving graces the US oil industry has to fall back on for their overall losses in costs for production, distribution and mere existence. It is safe to say, if Obama or any other president were to do away with these subsidies, the price we pay for gas would skyrocket even more. Oil is one of the world's most important commodities, and as a result, the nations that control the bulk of the world's supply have a great deal of power over its availability. The supply of oil in the world market has an impact on its price, and the fluctuations are passed on to consumers, especially in nations that use a lot of oil, such as the U.S. Oil prices are also determined by quality and ease of refining. Investors have the option of investing in oil futures, which they have an influence on the price of oil that is reported in the media. All in all, the oil market is quite complex, and a better understanding of how the oil gets from the ground to you, in all its forms, will hopefully help you to understand and deal with fluctuating prices. It should also be noted that there is no solid market for companies to make money. A competitive market just provides the opportunity, not a guaranteed profit. Bottom line, the economics behind a gallon of gas are pretty straightforward. It's the policies behind access to U.S. energy resources that are less certain, but critical to our energy future. Although the Marcellus Shale is the current drilling target for natural gas, and is considered to be one of the largest deposits in the world, there is yet another rock unit with enormous potential named the "Utica Shale," and it is only a few thousand feet below the Marcellus. It will be more expensive and difficult getting to those new deposits because of the thousands of additional feet it will take in drilling to reach Utica's natural gas. But, according to recent findings from the US Geological Service, (USGS) it will be well worth the effort. When the yield of Marcellus Shale wells start to decline, the USGS estimates there is approximately 38 Trillion Cubic Feet of natural gas waiting for drilling companies to extract an keep a continuing stream of NG for many years to come. Plus, there is an estimated 940 million barrels of oil and 9 million barrels of natural gas liquid by-products like propane and ethane. The USGS released its report (linked below) this past Friday and it shows the Utica Shale covers from West Virginia, Virginia, Ohio, Pennsylvania Maryland and New York. Drillers are just beginning to tap into the deeper Utica. To date, Pennsylvania and Ohio have issued 452 Utica well permits and 178 wells have been drilled, according to the most recent state data. Information on permits for West Virginia, Kentucky, Maryland and Virginia were not readily available. Steve Ford, VP of the Marcellus Shale Coalition Group stated, "As more (Utica) wells are drilled and more production data is assessed, reserve figures will likely increase," Forde hailed the Utica as "another game-changing opportunity." As one old saying goes, "One mans death is another man's profit." This boom for the natural gas industry, may spell additional doom for the staggering coal industry that doesn't need another knockout punch to its already decline in production and lost jobs. All reportedly due to the natural gas industries growth in providing a cleaner, safer and cheaper method to produce electricity. Compile the EPA's strict regulation and accusations that Obama has declared war against coal, this longstanding and historical industry may just be on its way into extinction. There have been times before when coal's demise has been prematurely predicted, most notably in the 1980s. This time though, people like renowned University of California's fossil fuel expert, David Victor says it is different. "Coal is on the way out because of the EPA, new regulations and natural gas. We could see coal down at 15 or 20 percent of electric supply over the next decade, that would be a huge change in an industry that historically has relied on coal for 50 percent or more of the electric supply." According to Arch Coal Company President and CEO John W. Eaves. "Current market pressures and a challenging regulatory environment have pushed coal consumption in the United States to a 20-year low." These job losses come as utilities increasingly switch from coal to natural gas, which has become cheaper as supplies grow. According to an article written by Russ Zimmer with the Coshocton Tribune in Ohio, "At Friday's prices for oil and gas, the USGS believes the Utica Shale contains would be worth about $214 billion. The natural liquids, depending on their exact makeup, could be worth several billion more. To extract these vast amounts, the USGS estimates it would take 110,000 wells in the gas window and another 17,500 wells in the oil window."